Assemble all of the fixtures and make sure all set-screws are snug but not too tight – you’ll be adjusting them later. If you’re using halogen bulbs wear gloves to touch them. Grease from you skin may shorten the life span of the bulbs. Place the fixtures in the ground following your design plan. It is best to keep the fixtures hidden by shrubs and structures. The goal is to highlight your home and landscaping, not your fixtures. Be considerate of your neighbors and avoid light trespass. Also be sure to keep your fixtures away from areas where lawn maintenance crews may damage them. Lay the cable from the transformer to your fixtures. Don’t mount the transformer yet. Be sure to leave several feet of slack by the transformer and a couple of feet by each fixture. This is one of our landscape lighting tips that will give you flexibility to make adjustments in the future. Connect the fixtures to the cable. We recommend direct burial wire nuts (DryCon is a good brand). Don’t use clips to connect your fixtures. 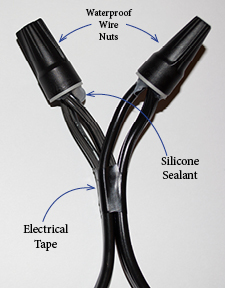 Waterproof connectors will give you a better connection that will last longer. Don’t skimp on this step – buy good connectors. If you’re using halogen bulbs you’ll want to make sure you balance your system so your bulbs will last their longest. LED lamps draw much less power and they can frequently be daisy chained. However we recommend hub systems whenever possible. Connect the wires to the transformer before you mount it. This is one landscape lighting tip that will make tapping to the unit easier. Place one wire on the common terminal and the other on the 12-volt tap. Turn the lights on and check the lights. If you see that a light is dim you may need to move that zone to a higher voltage tap on the transformer. You should use a volt meter to check the power at each fixture. Always start at the farthermost fixture and work your way towards the transformer. You’re looking for 11 to 12 volts at each. All of the fixtures should also be within about 1.5 volts of each other. You may need to adjust the layout of the wires, break up a run or move the run to a different tap. Program the timer module and install it with a photocell on the transformer. Mount the transformer at least 18″ above grade. Double-check that all fixtures are positioned and pointed the way you want them. Once you’re certain of the angle and position of the fixture, tighten the set screws and lock nuts. Make sure your cables are where you want them. Use a flat shovel to create a slit in lawns. One of our favorite landscape lighting tips is to use a ¾” wooded dowel to push the wire into the slit. If you encounter hard soil, try soaking the slit with water and come back after 15-minutes. This should make hard, firm dry soil easier to penetrate. Push the slit close after you’ve installed the wire. Be sure to bury the wire extra deep (at least 6”) where grass transitions to beds. This will keep the wire from getting cut by edgers. Wire in beds does not necessarily have to be buried but a layer of mulch should cover it. Wrap ties are good for bundling wires at nodes but don’t leave coils of wire. After dusk perform a full check of the system. Make sure you don’t have bad angles, broken globes, exposed wires or burnt bulbs. Be sure there is no glare from the fixtures and make sure neighboring homes are not exposed to wayward light. We have developed these landscape lighting tips based on years of experience. If this process seems a bit too difficult or time-consuming give us a call. We’ll be happy to come out and consult with you. Our time is free and our visits come with no strings attached. If you like, we’ll give you a free no obligation written estimate and back it up with our unmatched lifetime warranty on parts and installation.